Yellow diamonds currently possess the highest market demand of all other colored diamonds in the market. They have become one of the most adaptive fashion trends this decade. One of the most significant trend changing factors is famous celebrities flaunting their Yellow Diamond jewelrey, therefore rapidly increasing their popularity. Furthermore, their extreme rarities and unique characteristics have made them more desirable. Due to their growing popularity, many individuals have questions regarding the yellow stones. Here are some of the most frequently asked questions with to-the-point answers. 1. What are Yellow Diamonds? Yellow diamonds are a variety of colored diamonds. Many people are unaware that the precious stone, a woman’s best friend, actually comes in many different colors and are not just colorless. Yellow diamonds are just one of the many types of colored diamonds. Interestingly enough, diamonds found at the very bottom of the colorless color grading scale contain traces of yellow, and are the “bottom” diamonds in the yellow diamond category due to their faint color, as opposed to the more desirable intense yellow stones. The colorless grading scale goes from D-Z, and the yellow diamond color grading scale begins with the Y-Z range. It then goes all the way to the Fancy Deep/Dark Yellow grade. 2. Are yellow diamonds real? Like other natural fancy colored diamonds, the colors are a result of the compound element within the structure of the stone. The stones with a stronger yellow hue are often the result of more Nitrogen in the mix. They are 100% real, and absolutely beautiful! 3. How are Yellow Diamonds Made? Like any other natural diamond, these stones are formed over millions and millions of years. What causes the yellow coloring is the addition of Nitrogen within the compound element in the stone. The diamonds were formed in extremely high temperatures and immense pressure far below the surface of the earth. Once extracted, a diamond polisher who fully understand how to asses, cut, and polis the stone, will transform it from the rough it was into the unbelievable beauty we see in the jewelry stores. Color diamonds are named according to an internationally recognized naming pattern, which was developed by the Gemological Institute of America (GIA). 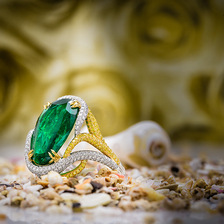 First, the carat size is stated, then the intensity of the stone, followed by any secondary hue (also called overtone colors) and finally the dominant color of the stone is mentioned last. For example, a 1.13 carat, Fancy Vivid Orange Yellow Diamond is a Yellow diamond (meaning the yellow hue is the dominant color present in the stone) with a hue of orange color. The stone weighs 1.13 carats and the intensity grade is called a Fancy Vivid (which is the most valuable intensity grade for a natural fancy color diamond). There are actually a number of 'nicknames' that yellow diamonds have developed over time. Many refer to yellow diamonds as Canary, as in a Canary Yellow Diamond , and some use the name Zimmy. A Canary yellow diamond actually refers to only a yellow stone with a very rich, high intensity (fancy intense yellow or fancy vivid yellow). The term Zimmy on the other hand, which is also thrown around quite often when talking about a vivid yellow with a deeper hue, actually refers to extra ordinary vivid yellow diamonds which originated from the Zimmy mine, which is located in Sierra Leone. The color of these Zimmy stones make other yellows look rather weak in comparison. 5. Where do Yellow Diamonds Come From? 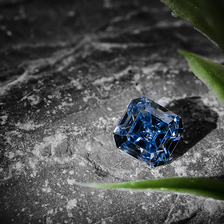 All natural diamonds were originally formed way below the earth’s surface, and are eventually brought to an accessible depth through volcanic eruptions. Now, the compound elements which essentially cause the color can happen anywhere, but are more common where the earth’s material in that location has more of any specific elements. Just as an example, the Ellendale mine in Western Australia was known for their mass production of yellow diamonds because many yellow diamonds were found in that location. That mine specifically has hit some hard times, but there are other mines around the world that produce these stones, such as in South Africa, Russia, India, and Canada. 6. Where are yellow diamonds mined? Yellow diamonds, among all others in the world of color are found less than one thousandth of the time compared to a white stone. Meaning, only 0.000 1% of mined diamonds are fancy colors. Yellow diamonds happen to be among the more commonly found color in this bunch. There are different mines throughout the world where yellows have been found, but the countries known best for producing these goods are Australia, Central Africa, Angola, Borneo, Brazil, Democratic Republic of Congo, and Sierra Leone. 7. 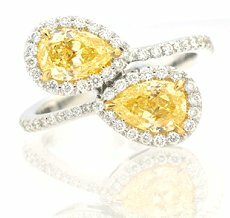 Are Yellow Diamonds More Expensive than Colorless Diamonds / White Diamonds? Though colored diamonds can be rather expensive as a result of their rarity, yellow diamonds can be quite affordable and sometimes cost less than a colorless diamond of the same quality. As explained above, the “bottom” yellow diamonds are also the “bottom” colorless diamonds, so a diamond with a lighter yellow coloring such as Fancy Yellow will be less expensive than a colorless diamond of the same quality. Having said that, a Fancy Intense Yellow diamond or a Fancy Vivid Yellow diamond will cost more than a colorless diamond. 8. Are Yellow Diamonds Cheaper Than Other Diamonds? One of the greatest benefits of natural yellow diamonds, other than the fact that they are so unique, different, and beautiful, is that they have a lower price per carat than most of the other colors that are found! The diamond characteristics that have the greatest effect to the price of the stone are the actual color and the intensity in which it shines. A yellow diamond with a fancy light yellow color or even a fancy yellow color is cheaper per carat than most other color with a similar intensity grade. If the stone has a high intensity grade it will surpass the price per carat of a white diamond, but it will still definitely be less expensive than a similar blue, green, pink or red diamond. 9. How much are yellow diamonds worth? Since yellow stones are classified as a fancy color diamond, many assume that it would be worth more than a white diamond. The truth is, it all depends. The value of any diamond is assessed according to many different characteristics of the stone. However, even if two of a similar quality were compared, the value would still be quite different. As natural fancy colored diamonds are more difficult to find, the larger ones will have a higher price per carat than a white diamond because they are so unique. Also, although a smaller (i.e. 1 carat) yellow stone with similar qualities to a white stone can be less expensive, that would only be if the color intensity is rather weak. If it were a fancy intense or fancy vivid color intensity, it would have a higher price per carat and be more expensive than a white diamond with similar characteristics. 10. Why are Yellow Diamonds so Expensive? Those who understand the diamond trade, often find it quite confusing that yellow diamonds can have a lower price per carat than other stone, including even a colorless diamond! The reason is simply because of supply and demand. However, once it is a higher intensity grade the price per carat will surpass a similar colorless stone, but still be less than almost all the other stones in the world of color. 11. Are Yellow Diamonds Rare? Colored diamonds are considered the rarest gemstones on earth. However, of the colored diamond family, Yellow and Brown diamonds are considered the most common. They are far rarer than colorless stones, which makes them quite unique. A high quality stone such as a diamond with VS+ and VG/VG polish/symmetry proportion grades that is over 2 carats is harder to come by and will therefore be more expensive. 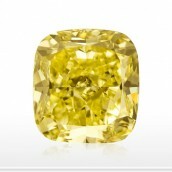 Certain Yellow diamonds make great investments, as their prices have increased drastically over the years. Additionally, it is easier to liquidize yellow diamonds because of their soaring popularity. The demand for them is high, higher than the supply, and supply and demand is everything in this market. 12. Which Yellow Diamonds are There? All natural fancy color diamonds are considered ‘rare.’ Although Yellow and Brown colors are the most common of the color diamond family, they are produced far less than colorless diamonds. Still, needless to say, some yellow diamonds stand out! The most famous yellow diamonds around are the Tiffany Yellow, the Allnatt Diamond, the Cora Sun Drop Diamond, and the Incomparable. 13. Yellow Diamonds vs. Colorless Diamonds? Individuals tend to choose colorless diamonds for engagement rings as well as jewelry pieces because they are traditional, and safe. However, these days many are becoming bolder and breaking the typical traditional choices by choosing more unique options. People choose yellow diamonds over colorless because they are different, display beautiful colors, are vibrant and still have that stunning diamond shine. 14. What Makes a Diamond Yellow? One of the most important things to understand about a yellow diamond, at least natural yellow diamonds, is that they are NATURAL. They are not colorless diamonds that have been dyed, but rather, they are found in the rough boasting this incredible color. Every colored diamond has a cause for its color. Yellow diamonds owe their color for the most part to traces of nitrogen found in the diamonds. It is this impurity that gives yellow diamonds the beautiful yellow color. 15. How to buy yellow diamonds? Back in the day, because they were such a rare find, the finer colored diamonds were only collected by the kings, queens, and wealthiest members of a community. However, as time went on, especially with the widespread use of the Internet, there are many vendors who sell these goods to the general public. Bricks and mortar diamond and jewelry stores usually hold one or two, but won’t invest in many since there is a larger demand for white goods. Your best bet for a wide selection is an online vendor, only be sure to ask for a third party diamond grading report to ensure it is a legitimately good diamond. Yellow diamonds look fabulous when set in in jewelry pieces. 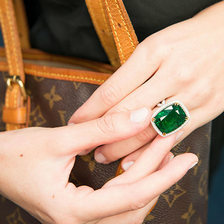 There are many benefits to this precious stone, but like any diamond, it must be chosen wisely and carefully. After researching the stone, asking the appropriate questions, and hearing the answers, it will be easier to come to the right decision and make an educated purchase.